Head-end View wrote: Keyboardkat, maybe you can answer a question that no one else on these boards has been able to do, since you were a Floral Park resident during the crossing elimination project. Word is that your village and the LIRR were seriously at odds during/after the project and that Floral Park is still angry at the LIRR to this day 50 years later. And supposedly this is the reason that New Hyde Park and Mineola won't let the railroad elevate thru their villages, 'cause of whatever happened with Floral Park. I was just looking at this thread and I saw this post, which I didn't happen to see back in 2012, and now it's four years later, but for whatever it's worth, here goes. I was not a Floral Park resident. I grew up near Albertson, and I went to school in Mineola. But before I got my driver's license I used to bicycle all over the place to watch trains. That's why I remember the Floral Park elevation project. Sorry I can't be of any more help than that. I well remember the Merrick-Bellmore-Wantagh grade crossing elimination project, too. I was living in Hempstead at the time and I was substitute-teaching at the Shore Road School in Bellmore for a couple of weeks. During the rush hours, traffic was really backed up by the parade of trains on the temporary tracks blocking the grade crossings. That project, when it finished, was a godsend. And when they add the third track on the mainline, they will presumably elevate the tracks through New Hyde Park, and that, too, will be a godsend to drivers, because of the frequency of trains during the rush hour. Thanks Keyboardkat re: Floral Park. I bicycled over to Hicksville during 1963-65 watching the elimination project construction there. I don't believe we're going to see elevation in New Hyde Park. I believe NHP and Mineola are still dead-set against it, fools that they are. Realistically, they don't need to do full grade crossing elimination in Mineola. They have the 2 major roads already in an over /under configuration with preparations south of No. 2tk for the installation of No. 3tk which is already installed over the the infamous herricks road. They really need to do a full elimination through NHP. Witt an minimum 15' clearance on NHP road. This project should include a regrading from the west end of herricks road to also eliminate the merrilon Ave bottleneck. And that bridge from 1909 which get whacked a few times a year. This would also widens and remove the small 1 lane bridge just west of there. Being original construction the stone work should be recycled and used to dress up the new span. So there you have it. A minimum of 5 under grades that can handle anything. NHP I'm sorry to say has absolutely no say in preventing the railroad from eliminating the crossings. Fact is one peep from any resident against grade elimination, the carrier should be in place to provide for those residents to be personally held 100% financially liable for any and or every accident at those crossings. Mark my works, their tone will change when it's comming out of their pocket. There's no way for them to eliminate Willis Avenue because that street has two grade crossings (Main Line and Oyster Bay Branches). -New Hyde Park needs a Babylon face lift but by putting one temporary track on each side of the existing ROW, and I'm really not sure what they can with School Street except put an extension of a viaduct then it goes downhill. Urban Avenue, I have no clue. Head-end View wrote: Thanks Keyboardkat re: Floral Park. I bicycled over to Hicksville during 1963-65 watching the elimination project construction there. I don't believe we're going to see elevation in New Hyde Park. I believe NHP and Mineola are still dead-set against it, fools that they are. at past hearings that I attended about the proposal for a third Main Line track during the 80s and 90s. littlest used grade crossing today by vehicles or pedestrians in Mineola. and all grade crossings between NHP and Hicksville are eliminated as part of the project. Well I don't know........the Metra System operating on the former Burlington Route in Chicago's western suburbs is a three-track raceway and they still have lots of grade crossings. Has everyone seen the video of the woman getting hit by the express train flying thru Downers Grove station on the middle-track when she crossed in front of the local train stopped in the station? seen the video, here is a picture of the crossing in question I took not too long ago..
Head-end View wrote: . 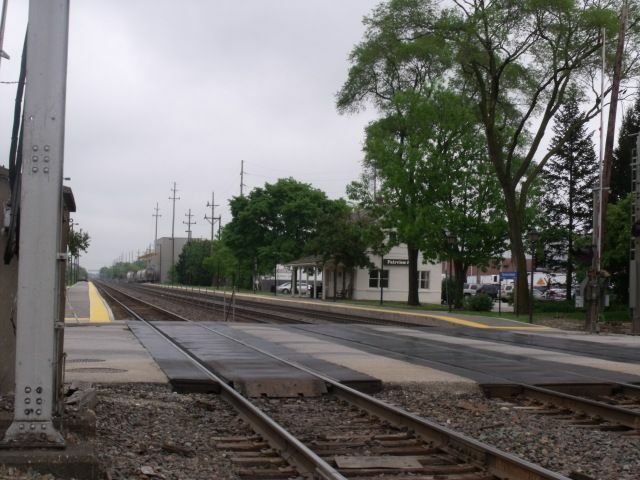 Has everyone seen the video of the woman getting hit by the express train flying thru Downers Grove station on the middle-track when she crossed in front of the local train stopped in the station? That could happen here now, with trains running eastbound on the normal westbound track. I see people crossing the tracks at Bethpage. All that's needed is for an express to pass and you will have the same thing. Could happen now? Happens more then you think. New Hyde Park was notorious for it. Engine 277 wrote: seen the video, here is a picture of the crossing in question I took not too long ago..
We actually have quite a few crossings like that in Chicago. They're really strict about not letting people board the train if they walk around downed gates even if it appears the train is stopped, just to prevent such accidents. Twp questions and this pertains to testing of when the stations were about to go into service. When they did the testing to make sure the third rail was running, and that there were no issues with circuits and the grounding for a smooth continuous third rail power, did they cut one track off of the temporary at both ends, connect it at both ends to the regular track and leave the other temporary track as the only one in service? Also did they use M1 non revenue train cars for the test over a few days if they did so? They did it with the Ronkonkoma electrification, the electrification to Hicksville and Huntington from Mineola, and even when Babylon was elevated. It's also obvious as stated that every station's elevated station opened and the temporary station closed on the same day. I mean they cut the tracks, but before that they had to have had one elevated in and the other at grade while testing was going on above and revenue service was still occurring on the ground. The LIRR ran diesel test trains through the elevated Merrick / Bellmore segment a few weeks before the elevated station opened (Merrick Life newspaper ran a photo of it in a JUN 75 edition). Wantagh / Seaford operated in a split configuration for a few days until trains completely transitioned to the new elevated tracks. And I do remember hearing there were grounding problems on the Amityville / Copiague / Lindenhurst segment after it opened. Heavy duty jumper cables were used to connect existing 3rd rail to new elevated 3rd rail during some testing. LB wrote: The LIRR ran diesel test trains through the elevated Merrick / Bellmore segment a few weeks before the elevated station opened (Merrick Life newspaper ran a photo of it in a JUN 75 edition). Wantagh / Seaford operated in a split configuration for a few days until trains completely transitioned to the new elevated tracks. And I do remember hearing there were grounding problems on the Amityville / Copiague / Lindenhurst segment after it opened. Heavy duty jumper cables were used to connect existing 3rd rail to new elevated 3rd rail during some testing. Yeah, I saw the picture in the Grade Crossing Elimination subject on trainsarefun.com where a Westbound M1 is passing a track crew cutting the Eastbound track from the temporary to the elevated, and there is a connecting jumper cable that fills in the gap, and they also did it after Massapequa Park opened where they had a temporary switch. I know the ACL-segment had grounding issues, but did they do testing before they put the elevated stations in service by running a few electric cars or diesel trains leading up to August 7th, 1973? Meaning, at one point for one day did one elevated track receive service, while the other was still doing grade level service. then throughout the day they cut the other track in just like Bellmore-Merrick?